For investors who want to work or experiment with the lunar cycles in their own trading we have developed a convenient software program. LunaticTrader 1.0 calculates all moon phases and lunar cycles which are relevant in the stock market and displays them in convenient charts. It helps you to anticipate the market action in the day(s) and weeks ahead, and it takes no more than a few minutes of your time. Includes tutorials for use of the program. The free trial shows you the lunar cycles since 1900. Registration will unlock all the cycles charts until the year 2100.
lifetime license for the software (password sent by email). bonus ebook with tips and strategies for using the Lunar cycles. free upgrades and customer support. The software is designed to work on Windows PC (Win 98, XP, Vista, Win 7, Win 8, Win 10). Thanks, for sharing information with us. I am looking for stock charting software. How much it cost me after trial. Our software is not a charting program. It comes with free end of day data and offers all the charting you can ask for. Most of the chart on this blog are made with NinjaTrader. do you have any analysis on X (US steel). The lunar cycle study is used for the market as a whole, not for for specific individual stocks. Of course, most stocks largely move with the overall market a good deal of the time. Danny Black period is sama like red and yellow is like green ? Any differents ? Black is a sub-portion of the green period. Yellow period is a sub-portion of the red period. New users shouldn’t concentrate too much them. The ebook that comes the program gives more information about the black and yellow periods. I want to know what is the Price of your Software . Suggest you have the Phase of Moon also for the Intra Day Chart . Have there been any updations in your software . What is the Price of the Software . Before i buy i ant to back test your software with Indian Stock Exchange . If you can send the E-Book and if i can back test it will help me to take a decision on the purchase . My E Mail id is veejay29singh@yahoo.com . There already are intraday charts in the program, but there is not much use in them. The strategy e-book is a bonus to people who paid for the program. Danny, is this a standalone trading strategy (including ebook)? Checking out the free trial, which has brief Help files and a few tutorials, will already show you the basic strategy for using lunar cycles. The ebook that goes to registered users offers more details, examples and various ways that lunar cycles can be combined with your existing method of trading or investing. Just purchased The Lunatic Trader and still can not find a good explanation on 2 lines, the DECLINATION and the LATITUDE of the moon. I already read is not important but I like to know what are they for. Every piece of information is crucial for muy research. Did test the software trial version now i am waiting for my codes to open it. Was not able to print the manual yet… Thanks in advance! The lunar red and green periods are most important for stock markets. So, I would focus on that first. Once you are used to it you can start making observations for the declination and latitude cycles too. They will work for some stocks/indexes/commodities and you will need to spot when those cycles are “ON”. The bonus ebook and the program instructions are in electronic format. Your password was sent out today. Just mail me if you have further questions. Perfect! Now I can understand what those curves represent. It could be certain crossing points at a given time. Tank you Danny. 2- Is there a way to overlap stock charts over Lunatic charts in sync with dates? 3- Are you planing to create new versions with more tools or improvements? Currently I think is V 1.0. ? 1) There is no way to do that. Remember you can click on the right (or left) side in the chart image to move to the next (or previous) month. This gives you a very easy way to watch several subsequent months. 2) There is no way to do that. This is on to-do list for a future version. 3) Yes, I intend to make a next version when time permits. It will include our LT wave. 4) See: https://lunatictrader.com/moon-cycles-in-the-markets/ for more info on distance, declination and latitude cycles. Referring to following image, I find Virus on Lunatic Trader software. Could anyone please forward this email to an related person? There is no virus in the software. Make sure you only download it from or site. Outside sources are of course never safe. It’s been a year since I purchased lunatic Trader. I am extremely satisfied with Version 1.0 and was able to do many charts testing the moon and stocks. Wished you could implemented more new tools for the next level. via Photoshop trading lines from stocks maintaining a sync with the time line. LT needs real time but mixed with trading dates produced inaccurate results with my charting style. Another add on you may like to consider is to stretch 100 years more before 1900. Sometimes I hit research that ask questions in 1887 with the moon without answers. As a user I wished LT also be expanded to a full page size on my computer screen. Today’s monitors are fantastic and LT seems to be limited to old monitors. Wishing you the best for 2019, have more ideas for LT, if you like to produce next version will be happy to be your Beta tester. Thanks! Daniel. I download it from your site and check with TotalVirus, and virus are found based on scanning. You can try to test it, and would get the same results. Danny, the scan you are showing as clean is lunatic trader.exe and the scan date is 2 years old. The version you are offering to download is lunatictrader1.exe and I just tried it. Yes, it shows 4 viri. But it might be good to try with different scanners. Some have high false positives and others have low finds. If only 1 out of 2 or 3 find the same viri, it is probably a false positive. * Kaspersky thinks the file is clean. Or, is there any way you can confirm the SHA on the drop box file is the same as your original? Maybe someone altered the version on the server? High reputation virus scanners like Kaspersky, Symantec, Defender, AVG,.. all find the file clean. Am I going to bother to correct false positives at services like “Jiangmin”? No. Please see following image, I would like to know on whether software can generate blue line or not. 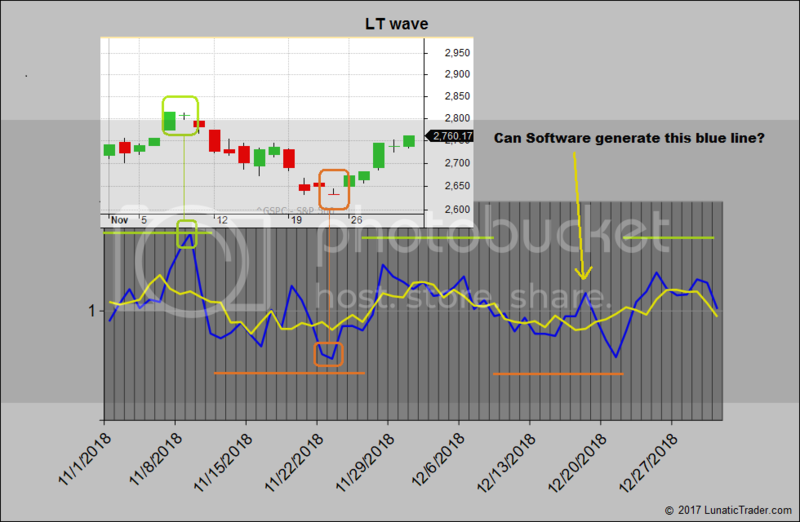 The LT wave is not included in the software yet. Hi Danny, how do you measure the “good moon phase” performace vs. “bad moon phase” performance? Do you enter the close before the green period begins and exit the close of the last “green phase” day? Or different? – Thanks. Hi. For the purpose of the tracking page, kept at https://lunatictrader.com/performance/ , we use daily closing prices. Sometimes the change from green to red (or red to green) period falls during market trading hours. Then we use 12 noon NY time as the cut-off. So if a green period ends on a given day at 1 pm then that day’s close will be used as end price for the given green period. If the green period ends at 11 am then the close of the previous day is used and today is considered the first day of the new red period. Hi Vorfahrt, I have been working with Lunatic Trader for a while. It’s been a constant experiment and sometimes I am in sync with my stocks other times no so much. I am all alone with my tests and studies. if you like we could join efforts and ideas if you are interested on LT. Send me an email and we can chat. Thanks! Hi Danny, I am very satisfied with LT. Will always push you for next version to add new features. LT has proven itself for over 2 years now with my strategies. My latest test in all March 2019 produced 70% accuracy under strict conditions and beyond that over more +% if I lax the rules. I learned how to expand and use the software to forecast stocks. Current test is putting a 90 day forecast to the test. Not all stocks are ideal for LT and trying to unlock those particular conditions. All I can say is Thank you Danny! Thanks for the thumbs up, Daniel. Adding new features is not as easy as it sounds. Sometimes less is more. I am always testing and working on different ideas, but I wouldn’t add them in the program without years of forward testing. I will add the LT wave to the program when time permits, because the wave has done well in tests.